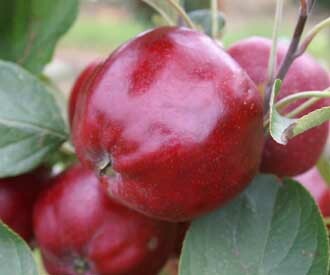 A legendary dark red dessert apple from Scotland with some red flesh. Please select the rootstock, age and tree form available items in the table below. The choice of rootstock is important as it determines the size to which the tree will grow when mature. Trees are available either as maidens which are untrained one year old trees or two year old trees already trained in a particular form. Reduced price trees when available are smaller one year old trees or two year old trees which have less well developed heads than our regular trees but are otherwise perfectly good healthy trees offered at a lower price. Trees are supplied bare root during the planting season from late November to early March. Further information is available below. The availability information shown in the availability column in the table is always up-to-date. Arose in Carse of Gowrie, Scotland. First recorded in 1883. There is a colourful story behind the rather strange name. A ploughman was caught stealing apples from the Megginch estate and shot by a gamekeeper. His wife threw the stolen apples on a rubbish heap. One of the seedlings which arose was resued and gave rise to the variety which was named after the unfortunate ploughman. Medium to large, flat-round, ribbed fruit. Blood red skin. Crisp, juicy flesh becomes stained pink when very ripe. Sweet with a light flavour. Vigorous tree.